The award which was established just a few years ago in recognition of an organization or partner that has demonstrated outstanding support and commitment to the VEP mission. 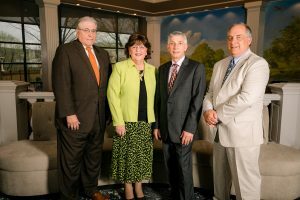 To mark VEP’s 32nd year of service, the 2018 Community Partner Award was presented to Lou Beccaria, Lynn Pike Hartman, John Colarusso and Julian McCracken of the Phoenixville Community Health Foundation. Since 2014, friends at PCHF have granted VEP $115,000 for outreach and operating support, as well as provided invaluable guidance towards our financial sustainability. Due almost exclusively to their financial support, VEP initiated an outreach program within the greater Phoenixville region four years ago to respond to its growing population of immigrants in the western and northern parts of the county. This “VEP without walls” program included the hiring of an outreach coordinator who could provide direct services to students and tutors, such as student intake interviews and tutor training workshops. Outreach in new communities like Phoenixville allows VEP to support immigrants in these regions by eliminating barriers posed by lack of transportation and available language services. The Foundation’s partnership with VEP has progressed beyond program development to a focus on financial sustainability. The “VEP without walls” funding model established with PCHF has inspired similar grants and outreach in other communities around Chester County. Beyond the foundation’s support, Dr. Beccaria and Ms. Hartman have personally gone above and beyond in sharing their guidance and expertise, whether formally, through Dr. Beccaria’s position on VEP’s Advisory Council, or during informal conversations, an invitation to talk about shared challenges and learn what’s really needed in the greater Phoenixville region. The mission of PCHF, to improve the health and quality of life for people in the greater Phoenixville region, especially those at risk for falling further behind socially and economically, aligns well with VEP’s mission of empowering immigrants to become successful citizens and community members through one-to-one English language tutoring and cultural guidance. 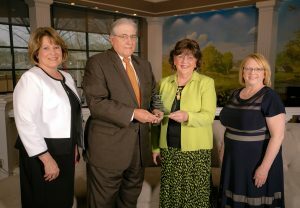 Accepting the 2018 VEP Community Partner Award, Lou Beccaria and Lynn Pike Hartman (center), Valerie Rozek, (far left) President of the VEP Board of Directors and Terri Potrako, (far right) Executive Director.